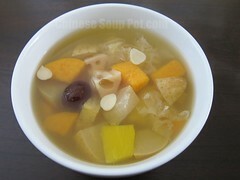 This is a heavenly and unbelievably refreshing papaya and milk dessert soup, with the light fragrance and taste of almonds. It is lightly-sweetened, yet so delicious and thirst-quenching that this cold dessert is just perfect on a hot day. This dessert has moisturizing and skin-beautifying functions. This soup is also remarkably easy and inexpensive to make.